Annapurna Base Camp Trek is a very classic trek in Nepal which is also referred as the Annapurna sanctuary trekking. The Annapurna Base Camp Trek route takes to the most spectacular mountain scenery, charming settlements of Gurungs and their slate-roofed houses, incredible rhododendron forests and deep sub-tropical valleys. The Annapurna Base Camp Trek route is specially designed for those trekkers who love to see and enjoy the flora and fauna and panoramic view of the Himalayan range. Trekking on this route will take you through the gorgeous lowlands of the wonderful high mountains and breathtaking scenes of the Annapurna range. 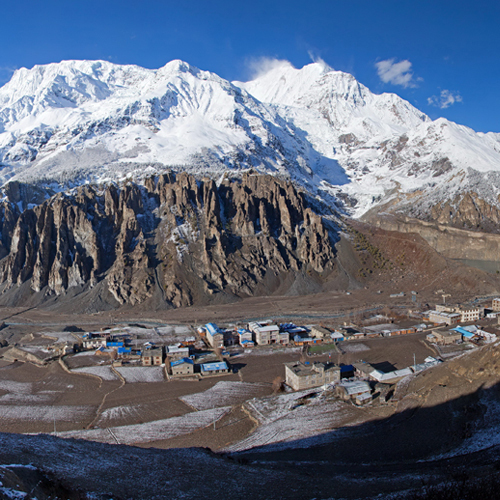 Annapurna base camp is situated at 4,130m above the sea level which lies in Annapurna region. Where, Annapurna region lies stretching along with Lamjung Himal from the Kali Gandaki in the west to the Marshyangdi in the east in central north part of Nepal. Annapurna Region is famous for trekking, expedition, hiking, and climbing. There are many attraction of this trek like the panoramic views of Himalayas, also flora and fauna along with amazing blending of culture and lifestyle, and also get chance to see wild animals like Himalayan Thar, Musk Deer, Leopards, and different species of birds too. After your arrival in Kathmandu, our representatives will pick you up and transfer you to your hotel in the most luxurious car or jeep in Nepal. There you will have the facilities of snacks, comfortable seats, gaming, and the most searched one i.e. WIFI. You will be able to use WIFI and immediately update your friends and family about your arrival in Nepal in no time with pictures as well. After you reach hotel and rest for a while, you will be introduced to our managing director and guides who will be assisting you in your trek. We officially begin our sightseeing on this day. Our guide will take you to the UNESCO World Heritage sites in Kathmandu. You will visit Kathmandu Durbar Square where you will observe more than 500 years old Nepalese art and culture. Swayambhunath also was known as Monkey Temple is another popular tourist destination that you will visit. Pashupatinath (Hindus’ greatest temple) is another place you will visit on this day. Bouddhanath, which is in a walk distance from Pashupatinath will be another spot of your visit. It is one of the largest stupas of South Asia. Flight and Trek to Phakding On this day, you will be driven to the domestic airport to take a flight to Lukla. The flight from Kathmandu to Lukla will take about 30 minutes in approximate. This trek will take about 4 hours to complete. You will be able to enjoy the beautiful views of mountains, lakes, rivers, forest, vegetation and many more. After you reach to the Tenzing Hillary airport at Lukla, you will begin your trek to Phakding enjoying the beautiful views of greenery forests with the view of people of Sherpa culture and their ways of living, small and beautiful huts, and many more. 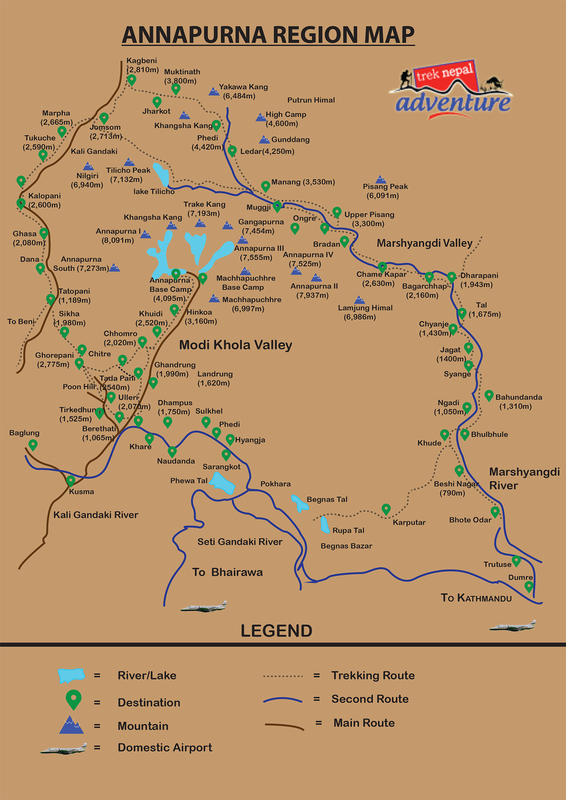 On this day, we trek from Phakding to Namche Bazaar via Monjo which is the entrance to Sagarmatha National Park. We pass the trial through Dudh Koshi river (milky river) enjoying the beautiful scenarios of pine forests, fir and rhododendron forests which will make your trial more beautiful. The most ravishing views that we get are the views of giant mountains and a bridge named Tenzin Hillary Bridge. After a long walk of about 2 hours, we reach a viewpoint named Toph Danda from where we get the splendid view of the surrounding. After exploring the area, we return back to the luxury lodge booked for our team. Stay overnight in Namche Bazaar. Side Trip to Thamo This day is for rest and acclimatization but you can also join a short side trip to Thamo where you can get close to the old sacred monasteries. After viewing the beautiful monasteries and the scenery around, you will visit Mende which is also famous for monastery around. Here in Mende, you will have cultural lunch in such a height. You will have several options to choose from the menu for lunch which will be provided to you in near future. After the lunch, we will march downhill to Namche Bazaar where we will be spending our night. Phortse, also called Phorche, is the farming village in Khumbu Valley in Nepal located at the height of 3840 meters. Today we visit this place passing through other beautiful villages inhabited by the Sherpa people with their own cultures and lifestyle. You will also get the beautiful sight of forests, small waterfalls, pine tree, colorful rhododendron leaving its splendid dot marks on the green base, and many more. While on the trial, we will stop in Phortse Thanga (birthplace of Lama Sange Dorje) which is at the height of 3680 meters, and have lunch. After lunch we will head forward to Phortse where we will spend our night. It is one of the most interesting days of this trek. Today, we trek uphill to Dingboche passing through different monasteries like Thakri monastery and Pangboche monastery in Pangboche (3930m). At this point, you will get the amazing view of Mt. Ama Dablam, Lhotse wall, and Mt. Everest peaking up to the left of Mt. Lhotse. From Pangboche, there are two routes for these trial i.e. lower and upper routes. We suggest going through the lower route as upper is our route for descent. Reaching Dingboche at the altitude of (4,410m) is followed by roaming around the area enjoying the view of Imja River, Ama Dablam, and many more. Here, the helicopter landing pad is also located near Moonlight lodge (one of the best lodges in the area) and also is the home for Internet Cafe and one of the world’s highest billiard parlors. Stay overnight at the most luxurious lodge with best of facilities. This day offers you rest before continuing further climbing towards the base camp. Today, you can take rest at your lodge and can roam around the particular area only and know about the vegetation, environment, and lifestyle of locales. If not, you can also have a hiking option to Chhukung Ri (5,550m). It is the rocky peak similar to Kalapatthar. Going to this peak does not need any previous experience but needs patience. In Chhukung, you will have lunch at the hotel which you will have the choice to choose but the most recommended is Hotel Bright Star. After lunch, we will descend back to Dingboche. Stay overnight in Dingboche. On this day, we begin climbing to Dugla and continue to Khumbu Glacier. The astonishing views of Tawache, Pumari peak, and Cholaste are eyes stacking. 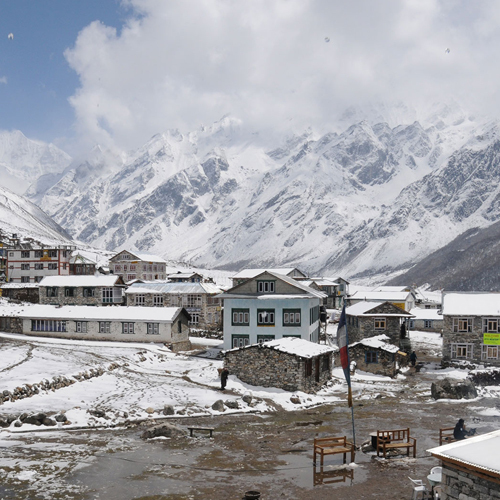 You can feel the high altitude because of extreme cold in Lobuche Village. We will trek around 11 km on this day which will take approximately 6 hours to complete. 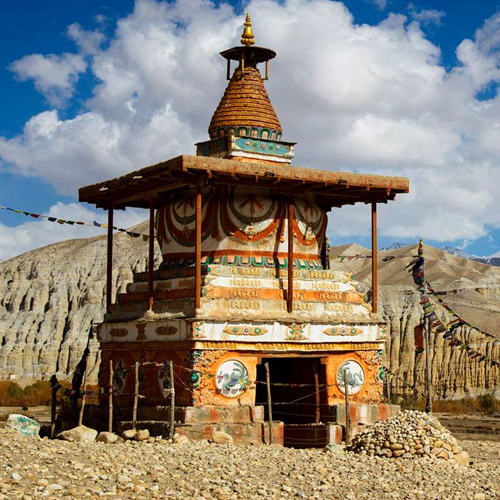 We explore the surrounding in the afternoon and stay overnight in Dingboche. On this day, we start our trek to Gorakshep from Lobuche which will take around 3 hours and the distance is around 5 km. In Gorakshep, we will have lunch and continue our trek to Everest Base Camp from Gorakshep with the astonishing views of mountains and peaks. The distance is around 5 km which will take around 3 hours. Everest Base Camp is the point for the Mountaineers to summit during this trek towards the peak. The experience of being at the foothill of world’s highest mountain cannot be expressed in words. We trek descend to Gorakshep in the afternoon and stay overnight in camp. On this day, we trek to the small mountain of Kalapatthar which takes around 3 hours to come back to Gorakshep where we will have our luxurious breakfast. Gigantic views of mountains and glaciers around you give a sense of heaven including the close-up view of Mt. 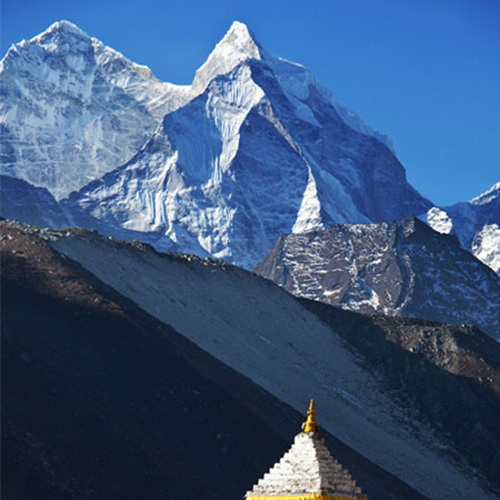 Everest, Amadablam, and Pumori peak. We continue trekking to a small settlement of Pheriche (4371m). In Pheriche, there is a hospital (H.M.A.R) and you can also explore the village of Pheriche where we will stay overnight. Early in the morning after breakfast, we will start our descent enjoying the view of Himalayan ranges, pine forests, fir, rhododendron forests, small houses and tea shops, etc. we will stop at Tengboche (3860m) for lunch. Here all the foods (Nepali styled foods) will be available which you can enjoy fully in Nepali tradition (sitting on the floor and eating with hands) which can be uncommon for you. You can enjoy the beautiful view of Tengboche monastery and its surrounding with hundreds of monks around. You can also observe army barracks, water driven prayer wheels, and many more naturally beautiful scenarios. Stay overnight at Everest View Hotel. This day we will descent (1400m) to Monjo from Syangboche which will take approximately 4 hours. After having luxurious breakfast, we will head downhill on steep paths reabsorbing the Namche bazaar and its beauty to Dudh Koshi Valley. Our trial for the day will stop at Monjo crossing the Suspension Bridge. Monjo is a small village consisting just about 30 houses in the narrow valley surrounded by mountains at the junction of Thamserku and Dudh Koshi River. Stay overnight at Everest Summit Hotel. This is the last day of our trekking for descent till Phakding. Here you can visit the monastery named Gumila monastery by walking little more (about half an hour) from the main trial. After monastery visit, we will again start our trek downhill to Lukla following the river valley. You will be provided free promenade and relaxation at hotel. Stay overnight at luxurious hotel in Lukla. We fly back to Kathmandu. 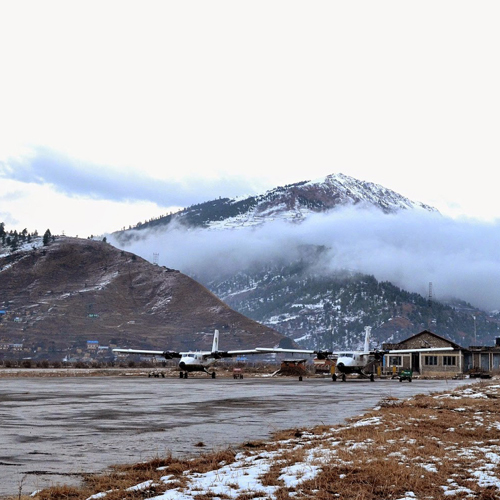 This short and scenic flight possibly makes you feel nostalgic because of the panoramic views of snowy mountains from your plane. You will be taken to the hotel. Shopping in the market is also a good idea especially, to your beloved ones. You can explore some sites in last moments of Nepal stay. In the evening, we have a celebration dinner together. Our tour in Nepal ends today and our representative will drop you at the airport. Your travel insurance ( Travel insurance is compulsory to take an adventure trip and it must be covered both medical & emergency evacuation with the worth of USD100, 000.00 minimum.